When ordered on the Webshop the VA720 includes UKAS calibration*, normally an extra £75, free of charge! 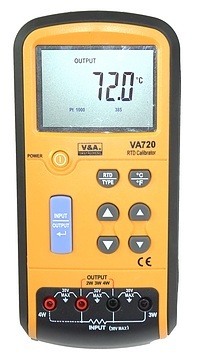 The VA720 RTD (Resistance Temperature Detector) Calibrator / Simulator is a precision source and measurement tool for calibrating RTDs and instruments. The calibrator measures using up to 4 wires and can measure in °C, °F or Ohms. Test leads and two large insulated crocodile clips are included and a soft carry case. *Unless version without calibration is selected. Note: The lead time for the calibrated version will be longer if the version without calibration is not shown as in stock.